Herbicide labels are legal documents providing important information about the product, its appropriate use, and the precautions needed to avoid off-target movement and to protect environmental quality. A herbicide label answers the “what, where, when,” and “how” questions about the product. Finding answers to these important questions is indispensable for achieving economical use with optimum results, and to avoid violation of state or federal law. Specific attention should be paid to the rotational restriction on the label before deciding on a crop rotation plan. In addition, it is important to make sure that the most recently updated herbicide label is consulted since label updates can happen frequently. What is the active ingredient in the product? What is the allowed use rate of the product? What weather conditions or soil requirements affect product use? What is the appropriate time to apply the product? What application equipment (e.g., nozzle type) is best for this product? What safety measures are needed while using or disposing of the product? How should the product be stored (e.g., temperature)? Where can the given product be used? What products can be tank-mixed? Where can the containers or left-over be disposed? Who should be called in case of emergency? What is the best time or crop stage to use this product? When should product use be avoided? How should it be mixed and how much should be mixed? How much and how many times can this product be applied in a year? Herbicide labels offer important, practical information. While the format may vary from product to product, all include key information necessary for safe use and better pest management is included. Group Number. The herbicide group number indicates herbicide site-of-action. This makes it easier to identify whether different products are in the same group so as to avoid repeated use of products with the same site of action. Rotating a herbicide group number is crucial to reducing the selection pressure because different herbicides in the same group essentially act at a common site-of-action and create a similar selection pressure. For example, in 2014 a Palmer amaranth population in Nebraska was confirmed resistant to Callisto (mesotrione), a Group 27 herbicide. Further studies revealed that the population was resistant to other Group 27 herbicides including Laudis (tembotrione) and Armezon (topramezone). Using the herbicide group numbers is easy compared to remembering or consulting a diverse list of herbicide names (Figure 1). Restricted Use Pesticide. If a herbicide is designated as a “Restricted Use Pesticide” that means it is available only to certified applicators or persons under their direct supervision. Special attention is needed while using the restricted products because they are usually injurious or toxic to non-target species. First Aid and Precautionary Statements. The best way to take care of emergency situations arising while working with a product is to keep the herbicide label and a first aid kit available all the time. Highlight the emergency contact information on the herbicide label because doctors may need to seek additional information in case of an emergency. Environmental Hazards. Environmental safety profiles, persistence of residual effects, and movement in soil varies among herbicides; thus, requirements for safe use are product specific. The environmental hazards section for each herbicide you use should be carefully reviewed to avoid contamination of water bodies and toxicity to aquatic organisms or other terrestrial non-target species. Measures listed under the environmental hazards section should be strictly followed because contamination can have long-lasting impacts and the reclamation process is often expensive or not practical. Product Information. This section provides detailed information about the active ingredient, site of action, spectrum of weed control and sometimes formulation. It is crucial to check the list of weed species that can be controlled, partially controlled, or which are not controlled and the crop/weed stage when the product is most effective. This information can help you determine whether an additional herbicide should be tank-mixed in to achieve effective control of all weed species present in a field. Resistance Management. 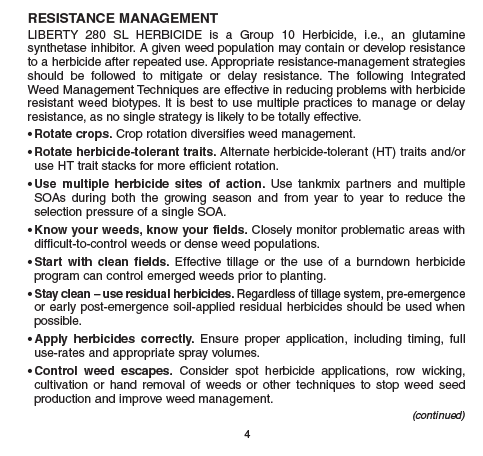 Herbicide labels usually have a section about the resistance management with a warning to avoid repeated use of a given herbicide to avoid the evolution of resistant weeds. Some herbicide labels also provide general weed management recommendations to avoid the occurrence of herbicide-resistant biotypes (Figure 2) and include information about the management of existing resistant biotypes. Mixing Instruction and Compatibility. These sections are important to know how the spray solutions should be prepared and stored and what other pesticides, fertilizers, or additives can be used with the product. These instructions vary among products and the specific herbicide instructions should be followed to achieve the best results. The recommended procedures to test compatibility also may be useful to check whether any product not listed on the label can be tank-mixed. Application Instructions. This section provides information about the use rate on different soil types, for different crops (if labelled for more than one crop), required equipment, carrier volume and other application instructions for ground and/or aerial application. This section also includes information on drift management, safe wind range, swath adjustment, and equipment cleaning (Figure 3). Crop Specific Information and Rotational Restrictions. This section should be consulted to check the crop specific use rates, application timing, and rotational restrictions. Use of photos from herbicide labels is only for educational purposes and not a promotion of any product.